Find out more about Paul on his profile at the Reinventing Transport site. Seth Goodman lives in Austin, Texas where he works as a designer at an architectural firm. His passion for sustainable and humane urbanism is the driving force behind his interest in parking policy. He hopes to use his graphic design abilities and penchant for diagramming to create a digestible version of parking policy reform for popular distribution. Parking is a hot button topic that affects nearly everyone and draws many opinions from both experts and the general public. 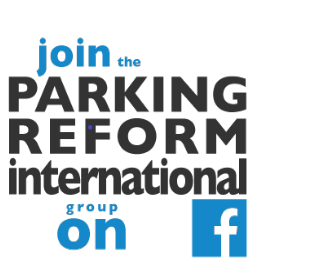 Seth believes that concise, visually-based arguments for parking reform will be an effective tool for winning policy debates and gaining converts. In January 2013 he began GraphingParking.com towards this end. Those efforts now continue at Reinventing Parking. Gabrielle Hermann is an urban planner who is interested in designing spaces that encourage active travel and children’s play. Her recent work focuses on how children’s freedom for unsupervised play and independent mobility has been compromised by car use. Gabrielle’s interest in parking springs from a belief that parking policies are a natural gateway to dialog about the type of mobility culture we want to cultivate. She views the emerging mobility trends of young people who are driving less as a chance to re-examine assumptions about the space given to cars. At Reinventing Parking she will continue thinking about the interface of social issues – the obesity epidemic and loss of neighborhood interaction, to name a few – with parking policies. Gabrielle lives car-free in a small, medieval city in southern Germany that is currently undergoing major parking reform. She is seizing on this moment of change to create a Pedelec-bike home delivery service for the inner-city businesses. Andrés Sañudo was born and raised in Mexico City, where he studied Applied Mathematics. After starting a career in investment analysis, in 2010 his passion for urban development and sustainable mobility led him to work in the Ministry of Urban Development and Housing. In 2011, he joined the Mexico City office of the Institute for Transportation and Development Policy (ITDP) as Parking Policy Coordinator where he has developed research on both on and off-street parking management, such as baselines studies and the terms of reference for them, guidelines and reports.